Jim is a representational landscape painter whose style has been heavily influenced by American and French impressionist painters. He selectively employs an impasto technique (Paint in some areas of a canvas will be thinly applied, while other areas will receive a thick layer of textured paint). Jim is inspired by nature; the changing seasons, farmland vistas, the geography of Connecticut and surrounding states. Like most landscape painters, he has favored locations and strives to work on location there whenever possible (en Plein Air). Jim constructs frames for all of his paintings. He uses reclaimed materials as a rule, and the design simplicity and coarse frame finish perfectly complement his unique painting style. Jim studied fine art at the University of Connecticut, and as a high school student was fortunate to receive some basic painting instruction from notable marine painters Carl G. Evers, and Christopher Blossom. Through select workshop attendance and continuous self-study, he has cultivated a painting style which allows significant room for expression, while maintaining a strong representational foundation. 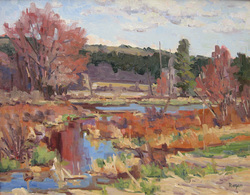 Jim is an elected member of the Connecticut Academy of Fine Arts, and his work is displayed in galleries throughout the nutmeg state. Michael Rogan began painting landscapes in oil paint after graduating in 1984 from the University of Massachusetts/Amherst with a M.A. in Art Education. He currently lives in Barre, Massachusetts, a rural town adjacent to the Quabbin Reservoir. 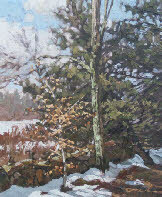 Much of Michael’s subject matter lies within close proximity of his home with occasional painting excursions to Rockport/Gloucester and the other New England states. Michael’s style is influenced by many artists of the past, particularly the American Impressionists of the late 19th and early 20th century and the painters of the early California School. Michael has also studied with contemporary painters Stapleton Kearns, Anthony Watkins, and Leif Nilsson. Making a landscape painting is an attempt at trying to understand who you are by connecting with the endless possibilities that Nature has to offer. Painting outdoors gives one the opportunity to respond rather than just look, and enables the painter, through observation and invention, to gain an understanding of the effects of light which is always a challenge. Every painting commands a resolution of tasks, and hopefully a stepping stone to a life time of learning with Nature being the source of inspiration. With the tools and materials of your craft, landscape painting in plein air becomes one of the best and sincere ways at getting to the heart of beauty. Ultimately the painting becomes a bridge between the artist and the viewer where the emotional and intellectual pleasures of creating and viewing the painting are shared and enjoyed.